Ukay-ukay Thoughts on Tarutao | Why Kan't Doc Zoe Write? Now that we are looking forward to the next island (or highland or inland… whatever), I pay tribute to one last time to that magical island we called home for a little over 39 days. 2. 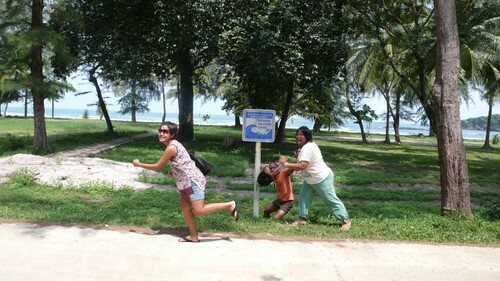 News from the castaways’ camp is the equivalent to “24 Oras”. 3. “Pier one” is an actual pier. 4. Liquor is banned, but bar hopping happens almost every night. 5. 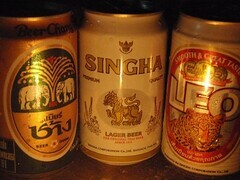 You consider Beer Chang, Singha Beer, and Leo an official part of your beer vocabulary. 7. Peanut butter gets stolen and a large bottle of cheez wiz is consumed in 10 minutes. 8. You are served with fusion dishes like PININYAHANG SAUSAGE at GINATAANG ITLOG for dinner, or a dish that’s a fusion of tinola-sinigang-nilaga-pininyahang whatever. 9. When omellette is prepared deep fried and served in any meal of the day and even in dishes that seem to look like nilaga. 10. Shopping means scouring the Art Department for Survivor collectibles. 11. You can’t get enough of Lay hot chili squid ridged potato chips and Lay shrimp & curry flavored tortilla chips. Yes, Lay without an “s” but looking like Lay’s. 12. There are crabs in the mess hall – those on your plate, or those visitors from the beach across base camp. 13. You find an excuse to have Milo or Ovaltine or coffee + Milo with your breakfast, lunch, or dinner, and at just about any time of the day – AND you actually have “drinking” buddies who tolerate this newly-acquired addiction (you-know-who-you-are). 14. You think you’ve eaten enough but find yourself returning to the buffet table for seconds and thirds…even fourths. 15. May numero ang etiketa ng mga damit mo. In our case, we’re Ms. 17, Mr. 20, Ms. 36, Ms. 77, Ms. 80, Dr. 100, Ms. 101, Ms. 102. 16. You squat in the toilets. 17. The bushes or the poncho is your toilet. 18. Head lamps are in fashion. 19. So are those arm warmers. 20. And those dry ocean bags. 21. Most bikes have de fects, e.g. walang upuan. 22. Nag-kakarera ang mga long tail boats. 23. Addict ka sa white monkey balm pampa-relieve ng insect bites. 24. Amoy white flower/insect repellant/white monkey at hawaiian tropic all at the same time ang kasama mo…heck, ikaw rin pala! 25. A cheeseburger is a piece of heaven kaya maaring magka-giyera dahil sa iisang cheeseburger. 26. Your work clothes and pambahay are one and the same. 27. You’re neighbors are up till 2am. 28. Ang alarm mo ay palakpak ng hepe ng area ninyo. 29. The mess hall is a: mess hall, conference hall, internet cafe, at barber shop! Special shout-outs to the following who have contributed to this list: Donna Medina, Alex Dionisio, Niña Ortiz, Nessa Valdellon, Leah Borlongan, Luz Balingit, Pat Del Castillo, Japs Rayos & Sheqs Torres. Ngayon ko napatunayan na may hangover pa rin talaga kayo. Buti na lang may Facebook.